There are a number of reasons investors are getting interested in lithium stocks. Here is a (very) brief overview of some lithium basics and what’s been happening in the market lately. Investors have become increasingly interested in lithium stocks for several years now, and there are a number of reasons why. Some are seasoned metals investors interested in looking beyond silver and gold. Others are new investors, drawn into the space by the ever-increasing hype surrounding Elon Musk and Tesla’s (NASDAQ:TSLA) sweeping electric vehicle plans. Whatever the reason, it’s important to get familiar with the lithium market before investing in lithium stocks. Here is a (very) brief overview of some of the basics. Lithium is a soft, silver-white metal used in pharmaceuticals, ceramics, grease, lubricants and heat-resistant glass. It’s also used in lithium-ion batteries, which power everything from cell phones to laptops to electric vehicles — demand for lithium from this sector is growing quickly. Lithium is found all over the world, in both hard-rock deposits and evaporated brines. There’s some contention as to which type of deposit is superior, but generally there are trade-offs either way. Editor’s note: As one of of our readers points out and expands upon in the comments below, lithium is also found in clay deposits. The world’s largest hard-rock mine is the Greenbushes mine in Australia, and the bulk of the world’s lithium brine production comes from salars in Chile and Argentina. Most large lithium reserves are in Chile, and the prolific “lithium triangle” spans Chile, Argentina and Bolivia. Australia was once again the world’s largest lithium producer in 2017, and it was followed by Chile and Argentina. There’s more than one type of lithium product out there. Technical-grade lithium is used in ceramics, glass and other industrial applications, while battery-grade lithium carbonate and lithium hydroxide (which are much more expensive) are used to make lithium-ion batteries; they can also be used for technical applications in a pinch. Tesla has stoked a lot of excitement in the lithium space, and despite recent headwinds lithium stocks as a whole have benefited. The company’s Nevada-based gigafactory is what first began to drive lithium excitement, but now it’s not the only lithium-ion battery megafactory that Tesla has planned. It’s also not the only firm with lithium-ion battery megafactory ambitions — as Benchmark Mineral Intelligence has pointed out, “the megafactories in China are also rising.” The firm expects the Asian nation to account for more than 50 percent of the world’s battery capacity for at least the next decade. In short, the world will continue to need a lot of lithium. And already some of the major producers are trying to make sure they’ll be able to provide it. For example, top lithium miner Albemarle (NYSE:ALB) announced plans to double production at its Australia-based Greenbushes mine in early 2017. Then, in mid-2018, the company announced a second expansion. FMC (NYSE:FMC), another large lithium producer, revealed its own expansion in early 2018. While some market watchers believe that those and other expansions will push the lithium market into oversupply, many experts have emphasized that the opposite is true. Earlier this year, well-known names in the lithium space, including Benchmark Mineral Intelligence, Joe Lowry and Chris Berry, shared their thoughts on why lithium oversupply and price crash predictions are overblown. 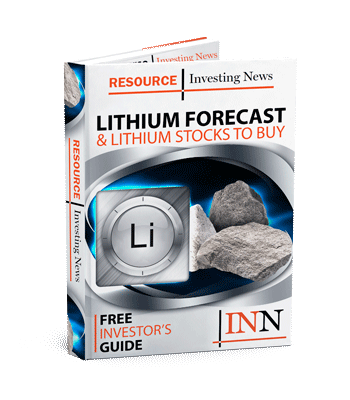 So where should investors interested in lithium stocks begin? To start, it helps to understand the lithium production landscape. For a long time, most lithium was produced by an oligopoly of producers often referred to as the “Big 3”: Albemarle, Sociedad Quimica y Minera de Chile (NYSE:SQM) and FMC. Rockwood Holdings was on that list too before it was acquired by Albemarle several years ago, making Albemarle that much bigger. Of course, smaller lithium stocks are worth watching too — to find out which ones are currently thriving, check out our top Canadian lithium stocks article. It’s updated on a quarterly basis when possible. Getting a look at lithium prices isn’t easy, and that can make it difficult for investors who are looking to assess the viability of a given project. Lithium products aren’t traded on the public market, and major producers don’t often give out stats. That said, Benchmark Mineral Intelligence is a good place to start. Since its inception in 2014, it has become a trusted source of price data. Even so, even Simon Moores, managing director at Benchmark, has emphasized that pricing can be a difficult concept for lithium investors to grasp. “The biggest myth surrounding pricing is ‘what is the lithium price?’ because there is no one price,” he explained at a recent conference. “The newcomers want one lithium price, but the existing market has a wide range of lithium chemicals and then grades within a specification,” he continued. His company publishes six lithium carbonate grades with a minimum specification of 99-percent Li2CO3 purity, four lithium hydroxide grades with a minimum specification of 55-percent LiOH and a spodumene feedstock price with a standard specification of 6-percent Li2O. Benchmark also releases broader global-weighted lithium average prices for lithium carbonate and lithium hydroxide, as well as a lithium price index, all on a monthly basis. For more on the methodology, click here. You can also click here for the latest lithium price commentary from Benchmark. This is an updated version of article originally published by the Investing News Network in 2015. Yes there is a 3rd type of Lithium source, Clay and this doesn’t need any evaporation pools or complex mechanism such as Hark Rock lithium to extract, The Tesla deal with the Sonora Project JV with REM Plc (LON:REM – rareearthmineralsplc.com) is using this as the source of it’s lithium. Funding for the operation is the only real outstanding issue and Tesla is wanting in on that also so should not be a problem either since the conditions were basically REM need to meet the initial 35,000 MT target in 2 years, with Tesla involved in funding this should not be thought of huge hurdle, especially since REM already have a pilot plant up and running producing the Lithium that Tesla wants at high purity. Since the Sonora Project (REM Plc & Bacanora) is only a short train ride from the Tesla Giga Factory this is a big plus point for the USA. And there are approx 20 car assembly plants near by that could want the lithium regardless. With VW and Porsche announce all electric vechicles by 2018 (http://www.cnbc.com/2015/09/14/reuters-america-porsche-and-audi-unveil-electric-cars-to-take-on-tesla.html) along with BMW i8 Series demand is set to rocket. REM Plc also own part of Western Lithium as well as a large chunk of BCN as well as another operation in Europe. REM Plc may be a small operation at the moment but once finance is in place (with Tesla backing that’s pretty much a given see RNS here http://www.lse.co.uk/share-regulatory-news.asp?shareprice=REM&share=rare_earth_min) and production is started it will be a huge player in the market. Musk would not have picked REM Plc as it’s 1st major Lithium supplier if it thought REM Plc couldn’t deliver the lithium. The Tesla Lithium deal with the Mexican Sonora Project (REM plc JV with BCN) breaks the choke hold I think of the ‘Big 3’ on the lithium market, and that’s why possibly the press in general appear to be so flippant about this REM Plc deal.. The director David Lenigas tweets this as the ‘Saudi of Lithium’ because of the size of the resource here in Mexico. Thanks for sharing this! We’ve added a brief note in the article.